DAVOS, Switzerland — Canadian and Mexican ministers leading Nafta discussions struck an upbeat tone at the World Economic Forum, saying the trade deal can be modernized while warning against hasty negotiations. 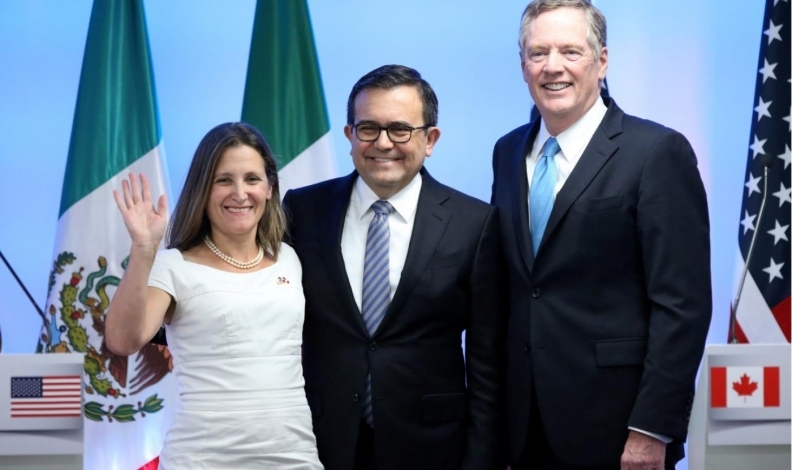 Canadian Foreign Minister Chrystia Freeland and Mexican Economy Minister Ildefonso Guajardo spoke on a panel at Davos, Switzerland on Thursday as their teams met thousands of miles away in Montreal during the the sixth round of talks on the North American Free Trade Agreement. Freeland cautioned that discussions on complex issues shouldn’t be rushed, and Canada is prepared for any eventuality on Nafta. Freeland said Canada had brought new creative ideas to Montreal, in particular on contentious areas such as rules of origin, which she described as “insanely complicated” in the complex negotiations over the auto industry. “We’re prepared for every different possible outcome,” she said. Guajardo reiterated a willingness to compromise on the key issue of automobiles. “Today we are in much better standing than a year ago to try to find those creative solutions that will mean a win-win-win for the three countries,” Guajardo said. Freeland, Guajardo and U.S. Trade Representative Robert Lighthizer will meet in Montreal on Monday to close out the current round of talks, a pivotal gathering where progress will determine the likelihood of reaching a deal to prevent President Donald Trump from abandoning the pact. Freeland met with Lighthizer on the sidelines of the World Economic Forum meeting in Davos on Thursday. Freeland's office confirmed the meeting but had few details. However, NAFTA negotiators in Montreal are mired in talks focused on breaking new ground on controversial U.S. proposals on the continental content requirements for automobiles and the pact's dispute resolution mechanism. Canada has tabled what is being billed by government officials as a set of creative counter-proposals on both those issues and the U.S. response could make or break the talks. Guajardo said it was obvious that the 22-year old NAFTA text needed modernizing, to reflect the march of technology and the changing energy balance in North America. “The car that we use as the base for rules of origin is the model from 1991. Look at the car today — it’s 80 per cent different,” Guajardo said. Nafta talks began in August and have been slated through March, with the seventh round expected in late February in Mexico City. Trump had initially wanted a deal by December, though trade negotiations of this scale typically take years. Trump, who has made contradictory comments about the 1994 treaty in recent weeks, told CNBC, "NAFTA’s a horrible deal, we're renegotiating it. I may terminate NAFTA, I may not -- we’ll see what happens." Freeland called on political and business leaders at Davos to do more to build support for trade, saying it’s proven that protectionism doesn’t work. She said Nafta talks will be a success if they cut red tape and lead to more companies taking advantage of the accord, as 40 per cent of Canadian exporters to the U.S. don’t bother using Nafta because of the regulatory burden. She cautioned against moving too quickly, particularly on discussion around automotive rules. “It’s a complicated agreement and updating an existing agreement upon which so much economic activity depends is also a delicate task,” she said. Nafta talks on the automotive industry revolve around the U.S. demand to hike the rules of origin, which govern what share of a car must be made in the three countries to be traded freely within the zone. Guajardo said the threshold must increase gradually, to give companies time to adapt.